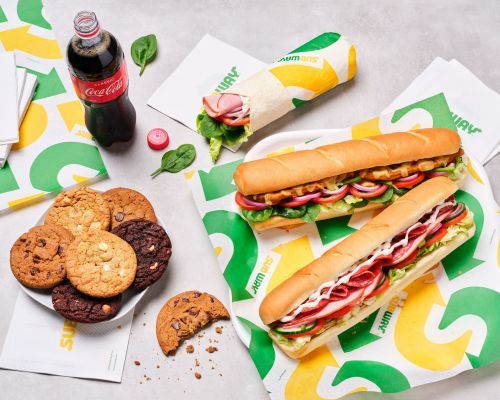 Menulog delivers for Subway - Bundoora so you'll be able to track your courier on a map. 1 x 600 ml Beverage, 2 x Cookies. Default nutritional values are based on the standard 6" sub recipe. Is there a better combination? Tender chicken strips, topped with premium tasty bacon, melted cheese, then smothered with ranch dressing. What are you waiting for, order yours today! Let this lightly crumbed chicken Schnitzel bring some lunch or dinner deliciousness to your table. This sub is made from 100% chicken breast and loaded with flavour! Dig in to this sub for big hearty meal. Juicy steak topped with your choice of melted cheese, add some freshly prepared salads and finish it off with a flavoursome sauce like Southwest. This flavour combination can’t be beaten. The ever popular Chicken Classic is a true taste sensation and only available at Subway Restaurants®. Try it once and we guarantee you’ll be hooked. The Subway® signature Italian B.M.T®. Layered with pepperoni, salami and ham and topped with delicious cheese, this combination of mouth-watering ingredients will melt in your mouth. Delicious tuna chunks mixed with creamy mayonnaise. Choose your salads and add your choice of bread, Its combination made in heaven. The meatball sub our signature sub and one of our customers favourites. Juicy meatballs smothered in rich Marinara sauce, topped with your favourite cheese and freshly baked bread, this sub will tantalises the taste buds and have you coming back for more. Hot out of the toaster oven it is The Pizza Sub with Cheese. Enjoy pepperoni and salami layered with tasty melted cheese and our signature Marinara sauce. Try it on freshly baked Italian Herb and cheese bread today. A seafood lovers dream. This sub is packed with a flavoursome seafood blend and mixed with our creamy mayo, add your choice of salads and freshly baked bread. Succulent chicken strips coated in Asian inspired teriyaki sauce and dressed with your selection of freshly prepared salads, finish it off with a drizzle of Sweet Onion sauce. Why not try this on a wrap today. Our succulent chicken strips are bursting with flavour while also being a healthy alternative. Simple, packed with protein and delicious. The Roast Beef sub is made with tender roast beef slices. There is a reason this is an old favourite. The Ham sub is the ultimate lunchtime staple. Add your favourite salads and sauces and you can make it your own every day of the week. This is a traditional favourite. Dive into tender slices of turkey, piled high with crisp salads. It's light filling and delicious. Jam packed with your choice of crisp salads this sub will be sure to make you feel good and get the most out of your day. Try adding some avocado for an extra protein kick!